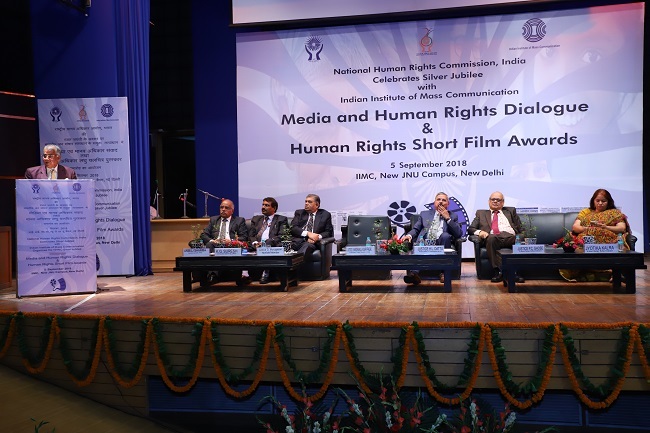 The National Human Rights Commission, NHRC, India launched its silver jubilee celebrations in collaboration with Indian Institute of Mass Communication, IIMC, New Delhi with a composite programme highlighting its association with media for the promotion and protection of human rights. Inaugurating the programme, Chief Guest, Mr. Justice Chandramauli Kumar Prasad, Chairman, Press Council of India said that media has mostly helped propagate an informed opinion about human rights. With the massive power and infrastructure to reach people within seconds with the changing time and technologies, the responsibilities and duties of media towards the society have also increased manifold. Justice Chandramauli said that, in order to perform its role in creating mass awareness on human rights, media personnel themselves also need to be fully conversant with the various aspects of human rights issues so as to enable people to recognize violation of human rights when they come across any such incident in daily life. The Press Council of India Chairman also said that the violation of the human rights of members of mass media is also a very significant aspect, which goes unnoticed. The provisions of the working journalists Act is followed more in breach than obedience. This needs to be looked into. The NHRC, Chairperson, Mr. Justice H.L. Dattu said that the Commission recognizes and cherishes the media as its valuable ally in addressing the issue of human rights violations in the country. He also said that the Commission, through its dedicated Media & Communication wing, in addition to its engagement with the news media, is also trying to use varied media platforms encouraging people's participation in spreading human rights literacy. These include, among other things, organizing human rights films festival besides the launch of human rights street theatre festival this year to reach out to the mind and hearts of citizens of the country. Earlier, Mr. K.G. Suresh, Director General, IIMC, New Delhi said that there is a need to develop a human rights curriculum in the studies of journalism. Mr. Ambuj Sharma, Secretary General, NHRC highlighted how the media reports have been useful for the Commission to take suo-motu cognizance of the human rights violations in the far flung areas of the country. 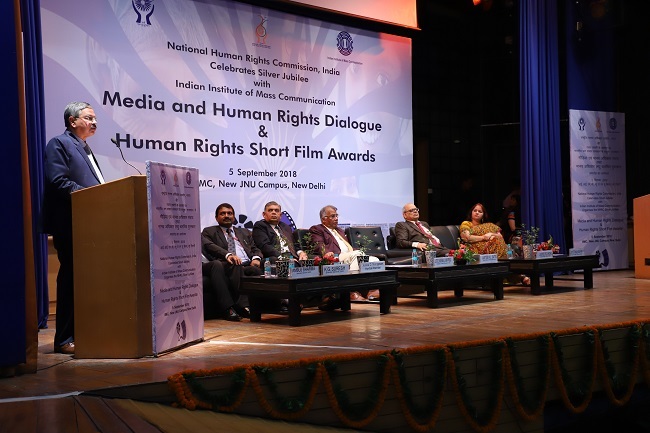 On the occasion, the three winners of the NHRC's fourth Short Films on Human Rights Competition - Dr. Dev Kanya Thakur, Mr. Biplab Majumder and Mr. Jayajose Raj C.L. were given the first, second and third prize of Rs. 1 lakh, 75 thousand and 50 thousand respectively along with certificates and trophies for their films - 'Behind the Bars', 'Third Gender' and 'It's Possible' respectively. The NHRC documentary made by the Films Division was also released on the occasion by the Chief Guest. The programme concluded with a panel discussion on 'The Role of Media in creating awareness on the human rights'. The participants included Mr. Prabhu Chawla, Editorial Director, New Indian Express, Ms. Arati Radhika Jerath, Sr. Journalist and Columnist, Mr. K.V. Prasad, Sr. Associate Editor, The Tribune, Delhi and Mr. Nikunj Garg, Sr. Editor, Times Now and Mr. Ambuj Sharma, Secretary General, NHRC, who also moderated the discussion. The participants included the faculty and students of IIMC and other media institutions, representatives from the media organizations and civil society, besides the senior officers of the Commission.